Download "APPROVED AUDIT ADVISORY BOARD REGULAR MEETING CITY OF FORT LAUDERDALE CITY HALL 8 TH FLOOR CONFERENCE ROOM TUESDAY, JANUARY 10, 2012 5:00 PM"
1 APPROVED AUDIT ADVISORY BOARD REGULAR MEETING CITY OF FORT LAUDERDALE CITY HALL 8 TH FLOOR CONFERENCE ROOM TUESDAY, JANUARY 10, :00 PM Cumulative Attendance 1/1/12 12/31/12 Board Member Attendance Present Absent Martin Kurtz, Chair P 1 0 Cindy Probeck, Vice Chair [5:11] P 1 0 Roger Ally [5:16] P 1 0 Bob Oelke P 1 0 Richard Owen P 1 0 Staff Linda Cohen, Board Liaison Elizabeth Cohen, Board Liaison Kirk Buffington, Deputy Director of Finance Gloria LeClaire, City Controller John Herbst, City Auditor Stanley Hawthorne, Assistant City Manager Douglas Wood, Director of Finance Nora Ostrovsky, Budget Manager Dawn Johnson, Treasury Pamela Winston, Housing and Community Development Emilie Smith, Office of Budget, CIP and Grants Lee Feldman, City Manager Kevin Keimel, Information Technology Jamie Opperlee, Recording Secretary, Prototype, Inc. Communication to the City Commission Motion made by Mr. Oelke, seconded by Mr. Owen, to send a communication to the City Commission to ask for staggered two-year Board member terms; three members would be appointed one year and two members would be appointed the next year. In a voice vote, motion passed 4-0. 3 Page 3 not be done at the same time this fiscal year. Chair Kurtz suggested this should be a requirement for an audit firm. Mr. Herbst said these always came as two separate documents; the single audit testing always came after completion of the CAFR. Mr. Wood stated they were making staffing changes, expanding the Budget Department. Chair Kurtz said he wanted this requirement to be a target of the 2014 audit. Mr. Herbst noted this could result in an auditor s extending time for the audit. 5. Discussion of the RFP Evaluation Process and Timeline Kirk Buffington, Deputy Finance Director Kirk Buffington, Deputy Director of Finance, said Board members had been provided a draft of the RFP, and the only substantive change requested by Mr. Feldman had been that this would be a flat fee contract; there would be no escalations or price changes. Mr. Oelke asked about the formula for ranking and pointed out this did not allow for a tied score. Mr. Buffington stated this rarely happened with an RFP and this methodology had been requested by the City Commission. He added that this method made it more difficult for the firms to challenge the decision. Mr. Buffington reminded the Board that once the process began, it was subject to Sunshine laws. Mr. Buffington said the RFP would go to the Commission for a seven-day review and then it would be released. There would be a pre-proposal conference on February 2 for firms wishing to respond to the RFP to ask questions. The responses were due back at the City on February 20. They would then schedule evaluation meetings. Mr. Herbst said there had been times when the City had failed to deliver required documentation to auditors so they had been unable to complete the audit in a timely manner. He asked how this would be handled if the contract was a flat rate. 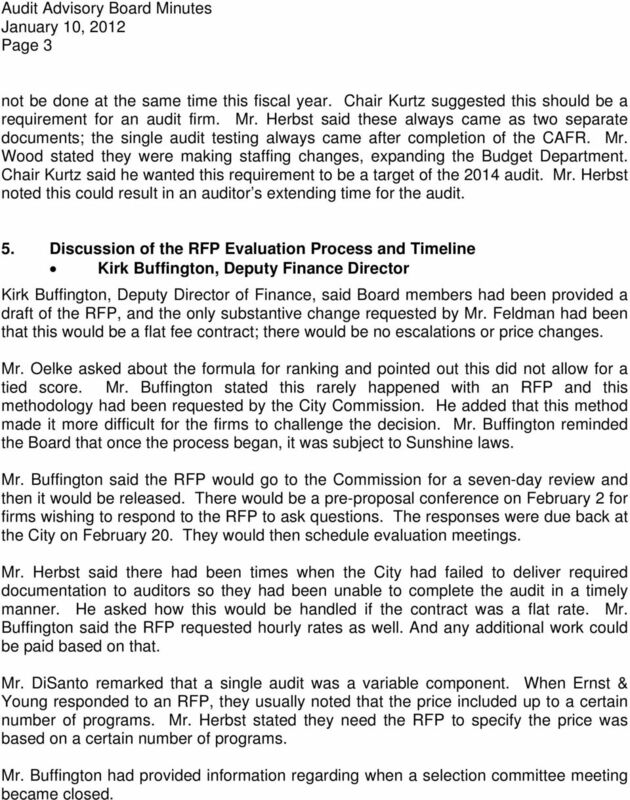 Mr. Buffington said the RFP requested hourly rates as well. And any additional work could be paid based on that. Mr. DiSanto remarked that a single audit was a variable component. When Ernst & Young responded to an RFP, they usually noted that the price included up to a certain number of programs. Mr. Herbst stated they need the RFP to specify the price was based on a certain number of programs. Mr. Buffington had provided information regarding when a selection committee meeting became closed. 4 Page 4 Mr. Buffington explained that under the City s current ordinance, there was no local preference for vendors. Mr. Herbst pointed out that if there was a cost allocation to any federal grant, local vendor preference was not permitted. Regarding evaluation criteria, Chair Kurtz felt that assessment of a firm s ability to meet prescribed report publication date [2c] should be weighted more than 5%. He suggested raising it to 10% and Ms. LeClaire recommended taking 5% from the 10% currently allotted to the firm for having a local office and past experience on comparable government engagements [1a]. Motion made by Mr. Oelke, seconded by Mr. Owen, to change the proposed evaluation criteria to reduce the weight of 1a to 5% and increase the weight of 2c to 10%. In a voice vote, motion passed 5-0. At 5:45, Mr. Feldman arrived. Mr. Buffington agreed to remove qualified City Staff from the first line of page 19 describing the makeup of the Selection Committee. Mr. Buffington said Board members would be provided a conflict of Interest statement they must sign. Mr. Ally stated under Part III.9, it should state that a contractor shall [not may] respond in writing if he takes exception.. Mr. Buffington agreed. 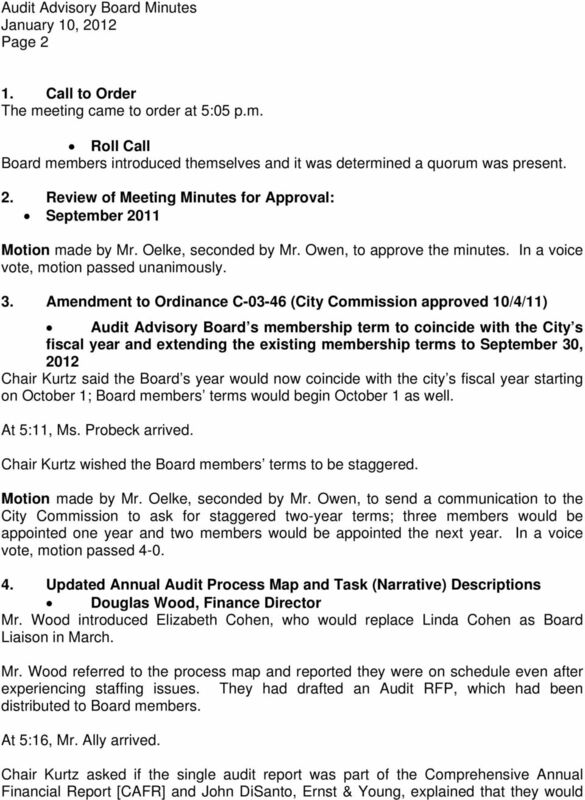 Motion made by Mr. Owen, seconded by Mr. Oelke, to approve the RFP with the changes noted. 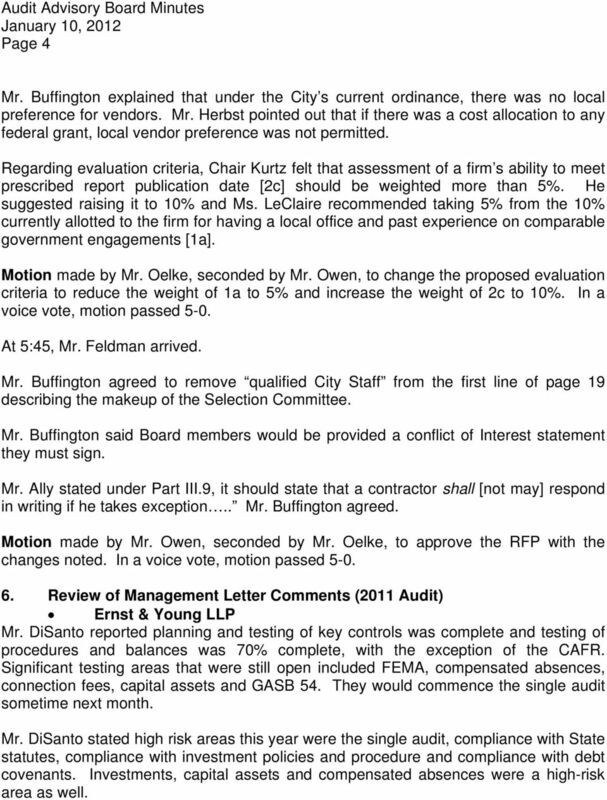 In a voice vote, motion passed Review of Management Letter Comments (2011 Audit) Ernst & Young LLP Mr. DiSanto reported planning and testing of key controls was complete and testing of procedures and balances was 70% complete, with the exception of the CAFR. Significant testing areas that were still open included FEMA, compensated absences, connection fees, capital assets and GASB 54. They would commence the single audit sometime next month. Mr. DiSanto stated high risk areas this year were the single audit, compliance with State statutes, compliance with investment policies and procedure and compliance with debt covenants. Investments, capital assets and compensated absences were a high-risk area as well. 5 Page 5 Mr. DiSanto said the prior year comments regarding Accounts Receivable had been cleared and he expected this comment to go away. Progress had been made in compensated absences, and Mr. DiSanto explained the issue was there were two systems that did not talk to each other. He felt this would continue as a comment until the two systems were merged or they were able to talk to each other. Mr. DiSanto said the Pension Investments comment concerned the fact that the Pension Plan included real estate assets. They recommended using a third-party appraisal firm to estimate those values and this had been cleared. Mr. DiSanto said the Capital Asset comment would remain; he remarked this was a system issue that would not be addressed overnight, it would be a process over a number of years. The starting point would be a physical inventory of hard assets; they would then need to be valued and the data would need to be entered into a module that could calculate depreciation. Regarding the current year audit, Mr. DiSanto said the first item was accrual of the Communication Services Tax. The September tax had not been accrued. The item would be adjusted and recorded in the City s financial statements. The next item was an internal borrowing in lieu of a special assessment that had never been recorded. Mr. Herbst said at a point in time this would cease to exist. Mr. DiSanto said they needed to update their inquiries regarding whether anyone on the Board or members of management were aware of any fraud, errors or violations that would be material to the financial statement. No members or staff present knew of any. 7. 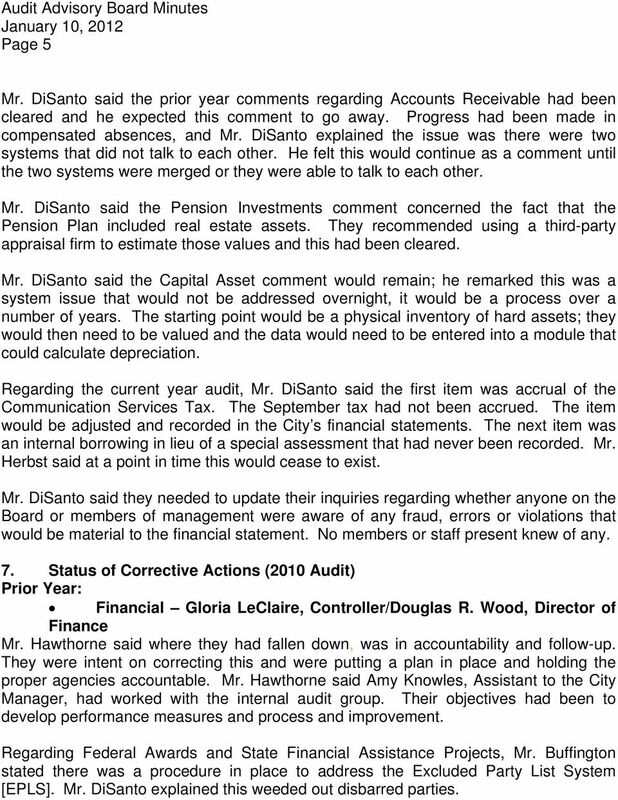 Status of Corrective Actions (2010 Audit) Prior Year: Financial Gloria LeClaire, Controller/Douglas R. Wood, Director of Finance Mr. Hawthorne said where they had fallen down, was in accountability and follow-up. They were intent on correcting this and were putting a plan in place and holding the proper agencies accountable. Mr. Hawthorne said Amy Knowles, Assistant to the City Manager, had worked with the internal audit group. Their objectives had been to develop performance measures and process and improvement. Regarding Federal Awards and State Financial Assistance Projects, Mr. Buffington stated there was a procedure in place to address the Excluded Party List System [EPLS]. Mr. DiSanto explained this weeded out disbarred parties. 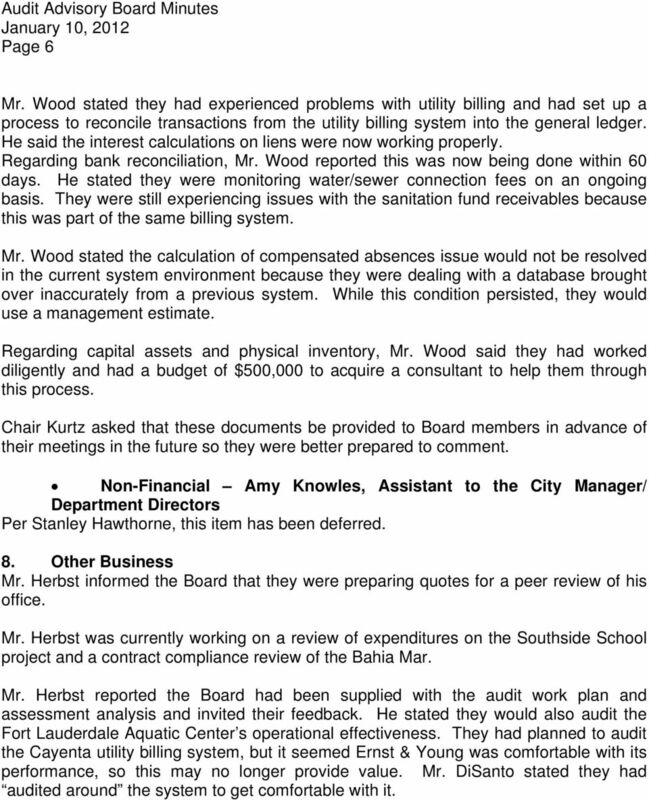 6 Page 6 Mr. Wood stated they had experienced problems with utility billing and had set up a process to reconcile transactions from the utility billing system into the general ledger. He said the interest calculations on liens were now working properly. Regarding bank reconciliation, Mr. Wood reported this was now being done within 60 days. He stated they were monitoring water/sewer connection fees on an ongoing basis. They were still experiencing issues with the sanitation fund receivables because this was part of the same billing system. Mr. Wood stated the calculation of compensated absences issue would not be resolved in the current system environment because they were dealing with a database brought over inaccurately from a previous system. While this condition persisted, they would use a management estimate. Regarding capital assets and physical inventory, Mr. Wood said they had worked diligently and had a budget of $500,000 to acquire a consultant to help them through this process. 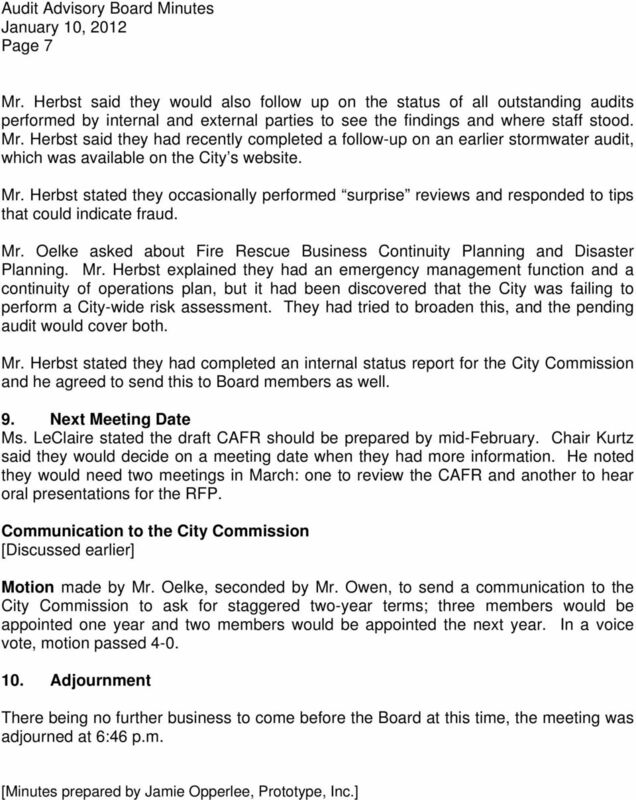 Chair Kurtz asked that these documents be provided to Board members in advance of their meetings in the future so they were better prepared to comment. Non-Financial Amy Knowles, Assistant to the City Manager/ Department Directors Per Stanley Hawthorne, this item has been deferred. 8. Other Business Mr. Herbst informed the Board that they were preparing quotes for a peer review of his office. Mr. Herbst was currently working on a review of expenditures on the Southside School project and a contract compliance review of the Bahia Mar. Mr. Herbst reported the Board had been supplied with the audit work plan and assessment analysis and invited their feedback. He stated they would also audit the Fort Lauderdale Aquatic Center s operational effectiveness. They had planned to audit the Cayenta utility billing system, but it seemed Ernst & Young was comfortable with its performance, so this may no longer provide value. Mr. DiSanto stated they had audited around the system to get comfortable with it. MEETING OF THE AUDIT, BUDGET, FINANCE, AND FACILITIES COMMITTEE OF THE BOARD OF TRUSTEES OF THE UNIVERSITY OF ILLINOIS. Sec Meetings, rules and procedure. Sec. 2 507. Meetings, rules and procedure. BILLINGS PUBLIC LIBRARY BOARD OF TRUSTEES BYLAWS All boards, commissions, and committees shall comply with this article and the following rules of procedure. 1. Roll Call Vice-Chair Sober called the Regular Meeting to order at 11:09 a.m.
NEW YORK STATE THRUWAY AUTHORITY NEW YORK STATE CANAL CORPORATION MINUTES AUDIT AND FINANCE COMMITTEE MEETING NO. 15. COLUMBUS COUNTY BOARD OF COMMISSIONERS Thursday, May 22, 2003 6:30 P.M. AUDIT COMMITTEE AGENDA FOR Tuesday, July 12, 2016 10:00 a.m. Library Conference Room David Barnum Chair David Cherashore Vice Chair Tony Heinrichs Jim Murtland Ken Olson 1. Roll call determination of quorum. --Inputs and posts journal vouchers to the general ledger; prepares month-end closing journal entries. 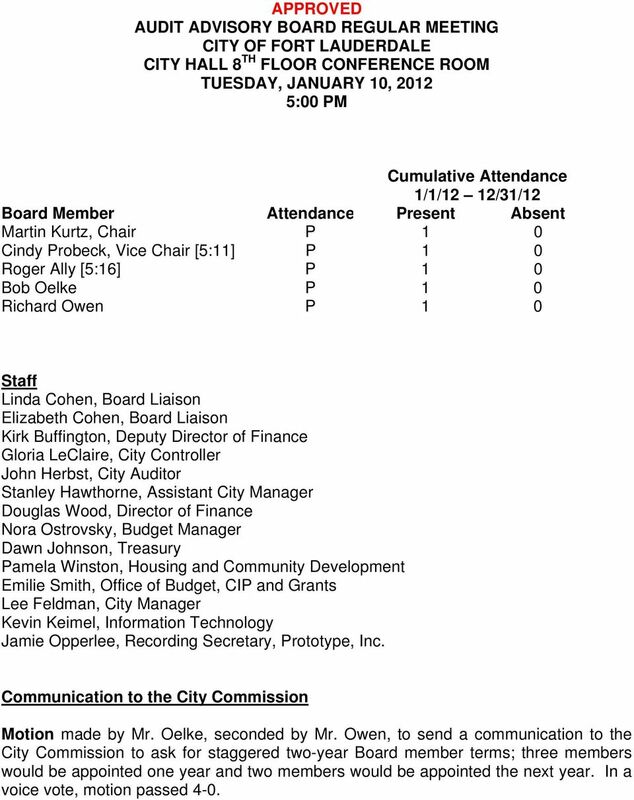 DRAFT CITY OF PALMETTO GENERAL EMPLOYEES PENSION PLAN BOARD OF TRUSTEES November 29, 2010-8:35 A.M.
Public Comment on Board Related Items Ms. Peiffer called for public comment on Board related items. No public comments were made. MINUTES. The September 13, 2006 meeting of the Utah Real Estate Commission began at 9:00 a.m. with Chair Walker conducting. ELECTRIC POWER RESEARCH INSTITUTE, INC. THE FLORIDA INTERNATIONAL UNIVERSITY ACADEMIC HEALTH CENTER HEALTH CARE NETWORK FACULTY GROUP PRACTICE, INC.